Spend a week swimming with dolphins in the Red Sea in one of the most important dolphin habitats in the world. Located off the south-eastern point of Egypt, Sataya, or “Dolphin Reef”, is home to an incredibly diverse array of animals, including a large number of wild spinner dolphins. The trip will depart from Marsa Alam, Egypt and venture to Sataya, six miles off the Egyptian coast. Guests will stay on Sharky, a beautiful live-aboard yacht 95 feet in length. Evening entertainment will include presentations and film screenings by 6-time Emmy award winning natural history cameraman Tom Fitz. Guests are encouraged to arrive early or stay on after the excursion to explore the amazing culture of Egypt. Price is €1065 per person. Tom Fitz is a cameraman, producer and director specializing in natural history films. As a freelance cameraman, Tom has worked for the BBC, PBS, NHK, National Geographic, and many more. He is best known for his work on Planet Earth I and II, Blue Planet I and II, Racing Extinction and LIFE. Tom spent four years working on a language acquisition project with bottlenose dolphins before beginning his career as a filmmaker. The majority of his first projects as a cameraman centered around dolphins and whales. Tom will be holding lectures and film screenings during this expedition. Gaïane De Brabanter is a marine biology and animal behavior teacher. She is a safety diver (PADI Rescue Diver) and a free diver (SSI level 2). Her scientific research on social learning in juvenile dolphins was published in the Journal of Animal Behavior and Cognition. As a naturalist with a passion for our oceans and their good health, Gaïane believes in making a difference by offering a rich and positive encounter with underwater life, especially the spinner dolphins of this extraordinary location that she’s been visiting for years. She will be offering informative talks about the local flora and fauna, including dolphin behavior, corals and the bay of Sataya. Phoebe Fitz is a stills photographer specializing in underwater portraiture and fine art photography. She works as a camera assistant for her father Tom on many of his natural history shoots and has a passion for sharing her love for the ocean with others. Phoebe is an RYT 200 hour vinyasa yoga teacher and NAUI certified Rescue Diver. She will be teaching yoga classes and photographing the dolphins on this expedition. Meet at Marsa Alam airport in the early evening. Guests will take a 2-hour shuttle to Hamata Marina and settle into their first night on the boat. We will begin the 2-hour traverse offshore early in the morning to arrive in the bay of Sataya, where the boat will be anchored for the week. Once the boat is anchored in the calm bay, seasickness is unlikely. The heart of the trip! Dolphins regularly come into the bay to rest and play, providing guests with the opportunity to swim with them in their natural habitat. The dolphins are incredibly friendly, playful creatures. Confident freedivers and scuba divers will have the freedom to dive as they please. Guests who are learning to snorkel will be led by the snorkel guide. Scuba lessons and an Open-Water PADI certification course can be offered if planned in advance. Daily yoga classes will be offered on the sun deck. In the evenings, Tom will be offering lectures and film screenings on his career working with marine mammals. Gaiane will be offering lectures on the local flora and fauna of the Sataya bay. 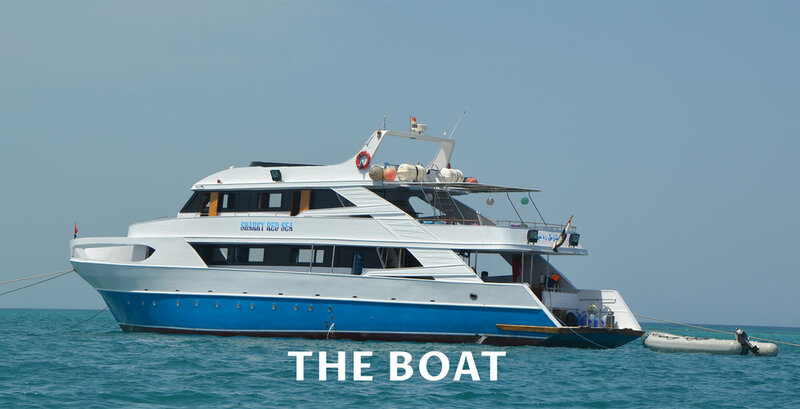 The 29 meter long boat offers plenty of space for guests to do as they please -- no activities are compulsary. We will traverse back to the harbour and spend the last night on the boat at the marina. The airport shuttle will be available to bring guests to the airport the following day. The Sharky is a beautiful 29 meter (95 foot) long motor yacht equipped with nine double guest cabins and two zodiacs. She will be host to fifteen guests, three trip leaders, the captain, and six crew members. There are nine double cabins onboard, each with an en-suite bathroom. The sun deck on the second level offers stunning 360° views and is where yoga classes will be held. It is also the ideal night time hangout for seeing shooting stars. The outer deck on the first floor is a cozy, shaded area for relaxation and enjoying the outdoor snack and beverage bar. There are two dining areas: one outdoors and shaded on the lower deck, and the second indoors and fully-air conditioned. Meals will be served three times a day.